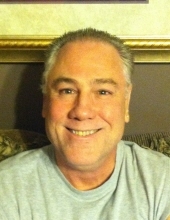 Mark Hagan-58, went to be with the Lord on January 24, 2019. He was a disabled veteran. He is survived by daughters; Marissa and Alexis Hagan. Siblings; Rita Soper (John), Charlie Hagan, Mary Hagan, Jacinta Collins (Paul), Edwin Hagan, Maria Stevens (Terry). He was also an uncle to many nieces and nephews. Mark had a lot of friends that were like family as well. He is preceded in death by his parents; Rita and Hugh Hagan and 4 brothers; Norbert, James, Dean and Jarrod. Military services will be Thursday, February 7th at 12:30 in the National cemetery in Radcliff. To send flowers or a remembrance gift to the family of Mark Nicholas Hagan, please visit our Tribute Store. "Email Address" would like to share the life celebration of Mark Nicholas Hagan. Click on the "link" to go to share a favorite memory or leave a condolence message for the family.